Two former England footballers will not be charged over the taking of a luxury private cab they admitted driving off in on a night out, police have said. Rob Lee, 38, and Warren Barton, 41, were arrested in July after the Mercedes E220 saloon was taken from Hackney Road, east London. The former Newcastle United stars admitted they drove off in the car when the owner stepped out of the vehicle. They then allegedly crashed it into a van and fled the scene. The car was found abandoned on Hackney Road. Officers said the owner of the car did not want to press any charges against the pair over the taking of the car. The ex-footballers were told this before they were due to answer bail on Tuesday. 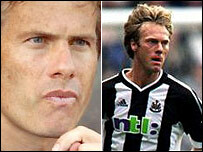 Lee, from West Ham, east London, played for Newcastle United for 10 years and was capped for his country 21 times.